Tuesday April 30th 1889 This was the centenial of Washingtons inaugeral as President and there was a parade and exercises in town. We got the work done as soon as we could and Mother and I went to town. Hattie went up to the church with us. And then we went to the depot to meet Charles he was up for the day. We all took dinner at Hatties. Will and I come home about four oclock and Mother later. 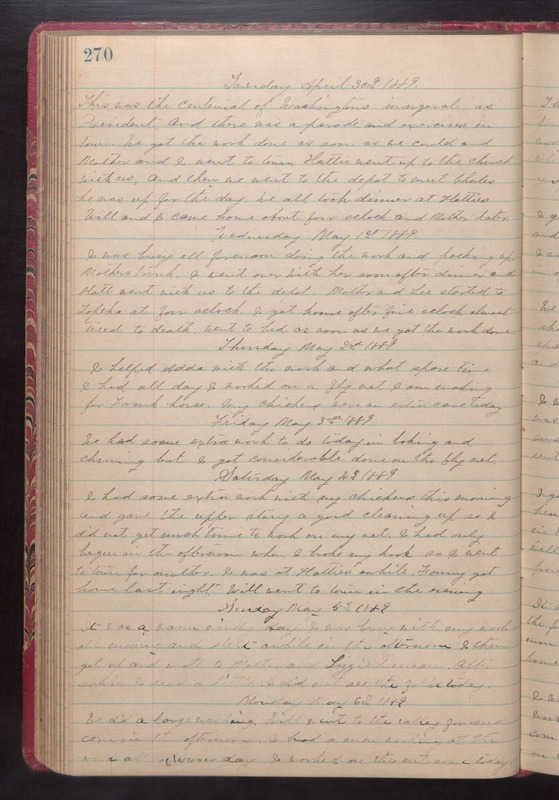 Wednesday May 1st 1889 I was busy all forenoon doing the work and packing up Mothers trunk. I went over with her soon after dinner and Hatt went with us to the depot. Mother and Lee started to Topeka at four oclock. I got home after five oclock almost tired to death. Went to bed as soon as we got the work done. Thursday May 2nd 1889. I helped Adda with the work and what spare time I had all day I worked on a fly net I am working for Frank horse. My chickens were an extra care today. Friday May 3rd 1889 We had some extra work to do today in baking and churning but I got considerable done on the fly net. Saturday May 4th 1889 I had some extra work with my chickens this morning and gave the upper story a good cleaning up so I did not get much time to work on my net. I had one begun in the afternoon when I broke my hook so I went to town for another. I was at Hatties awhile. Fanny got home last night. Will went to town in the evening. Sunday May 5th 1889 It was a warm windy day. I was busy with my work all morning and slept awhile in the afternoon. I then got up and wrote to Mother and Lizzie Duncan. After awhile I read a little. I did not see the folks today. Monday May 6th 1889 We did a large washing. Will went to the valley for seed corn in the afternoon. I had a man working at the road all [illegible] day. I worked on the net same today.